Neil Lennon claimed Hibs had let Dundee off the hook after watching his team dominate for 90 minutes at Dens Park only to be forced into settling for a point. The head coach was left to bemoan the fact that, for the fourth game in succession, his players had conceded the first goal, Steven Whittaker’s early challenge on Roarie Deacon presenting the home side with a penalty which was converted by Kevin Holt. But striker Anthony Stokes equalised with a clever finish six minutes before the interval as Hibs, in Lennon’s words, “bombarded” the opposition only for Dundee goalkeeper Scott Bain to produce a man-of-the match performance. Lennon said: “I was annoyed because we’ve given the first goal away, the fourth in a row we’ve done that. But I was very pleased with the level of performances, the chances we created, the intensity of our play and our will to win. In response to the disappointment not only of the result against Hamilton but the performance of his side, Lennon made four changes, Efe Ambrose, Lewis Stevenson and Dylan McGeouch all dropping to the bench while Danny Swanson missed out altogether. The shake-up saw club captain David Gray make his first Premiership start while Manchester City winger Brandon Barker, on loan for the season, also started for the first time in the green and white with Vykintas Slivka and Marvin Bartley, over the leg knock which had precluded him from Hibs’ past two matches, was given the nod. With Stevenson among the substitutes, Whittaker was called on to operate at left-back, a position the 33-year-old, recently recalled to the Scotland set-up, had operated in previously while on international duty. Scotland boss Gordon Strachan was among the spectators at Dens Park to cast an eye over not only Whittaker and John McGinn but their Lithuanian team-mate Slivka ahead of those two countries meeting on World Cup business in Vilnius on Friday. However, Strachan would have been as unhappy as Lennon at Whittaker’s first contribution to the game, sliding in with Deacon needing no invitation to go to ground although there was no question it was a silly challenge from someone of the Hibs defender’s experience. Goalkeeper Ofir Marciano guessed right, throwing himself low to his left and getting a hand to the ball but Holt’s spot-kick carried enough power and direction to nestle in the bottom corner of the net. Twice Barker stung the palms of Bain, forcing the Dundee goalkeeper into a full-length dive to push one shot away and them more routinely, helping the 20-year-old’s next effort over the bar. 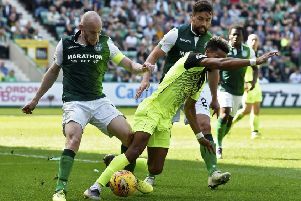 Hibs forced a succession of corners, a string of training-ground routines evident but coming to nothing before Barker latched on to Faissal El Bakhtaoui’s wayward pass and drove forward, releasing the ball into the path of Stokes whose shot was blocked. Holt might have put the Dens Park side two up as he rose to meet Scott Allan’s free-kick but he succeeded only in heading the ball straight into the arms of Marciano. The corner count continued to mount in Hibs’ favour as the Capital side pinned Dundee down inside their own half, Bain happy to concede another as he got down to his right to turn Simon Murray’s shot on the turn aside. But Hibs finally made their pressure tell, Whittaker firing in a low cross from the left for Stokes to cut across his marker and apply a deft finish at the front post, directing the ball high into the net with the help of a slight deflection off Dundee defender Kerr Waddell. Hibs were forced into a change after the interval, Darren McGregor having picked up a knock, resulting in Ambrose taking his place in central defence. Dundee had looked far from secure at the back and a slip by Jack Hendry gave Hibs’ top scorer Murray a clear sight of goal. He attempted to curl it past Bain but got just too much elevation on his shot, the ball rising over the bar. Bartley, still looking for his first Hibs goal, then played a terrific one-two with Stokes to burst into the Dundee penalty area only to be denied as Bain spotted the danger and raced from his line to smother the big midfielder’s shot. A great ball from McGinn put Barker in but Holt raced back to put pressure on the youngster who could do no better than prod his parting shot into the hands of Bain. The game was coming to the boil as the tackles flew in and words were exchanged between the two dug-outs and Dundee boss Neil McCann was on the end of a few soothing words from referee Don Morrison while Stokes and Ambrose picked up bookings in quick succession. Bain again came to Dundee’s rescue as he prevented Stokes claiming his second of the game and Slivka drove one over from a decent position. Dundee, though, were sniffing their first three points of the season and Marciano was grateful to see a low shot from El Bakhtaoui slip wide. But Stokes went even closer with less than four minutes remaining, rising to get his head to Gray’s cross only for the ball to creep inches past the wrong side of the post. Hibs, however, would have been disappointed not to have turned the superior possession they enjoyed for long periods into more goals, racking up 15 corners to Dundee’s one, firing 16 shots to their opponents’ five, nine of which were on target to the Dens Park outfit’s three.